Rachel Roy & Hayden Panettiere were the guest judges of Project Runway last week - while the designers had to create a look for the "woman on the go". My favorite looks were Christopher's and Sonjia's designs (images shown respectfully). Unfortunately, it was Buffi's questionable design that sent her home. Therefore, this week's Q&A with Buffi. Q: What made you want to be on Project Runway? Buffi: I wanted to be on PR since the beginning and applied so many times I filled out the application, and gone halfway through - it's a long process, but I finally did it this time. This seemed the right year to do it. Q: Best piece of advice you received from the judges? Buffi: I feel like they didn't give me advice. They put me down more than anything. I'm so different from them, my aesthetic. They didn't get what I was trying to say. I don't get what they like. It's totally cool. Q: What was it like with Rachel Roy & Hayden Panettiere there as judges? Buffi: It was great getting feedback from another designer [Roy]. I felt like the judges were attacking me, and she tried giving me advice. I felt like she was the only one who gave me constructive criticism. Q: If you could do it again, would you go for a different design or stick to what you did? Buffi: Definitely the same - sticking to what I did. Michael Kors was right - it's true I don't know how to design for the modern, working woman. I don't know how to dress corporately. I did get a great response from tweets and emails, saying "We love you, stay true to yourself!". I went out at the right time. It wasn't the right competition for me. Buffi: A few projects actually. I'm working on a book that will come out next year on dress making. So I've been completing that. I also have been working on design projects for NY performers. I have a few people I'm designing for - loud, crazy pieces. Q: What did you think of Raul returning to the show? Buffi: The week he got out on, it wasn't his best work and I felt like he had more to show as a designer - so when he came back, I was super, super happy. I hadn't known him that long , but I definitely felt like he had a lot more to offer. Q: Do you think it was low quality of Andrea & Kooan to drop out so early like that? Buffi: Yeah, I mean, Andrea is a teacher - like, I don't know how embarrassing that would be. Even though, you know what you're getting into and you know it's a competition, it's going to be difficult. But you can't just run away like that - I mean, what does that say to your future students, your current students. I was really, really shocked because I kinda looked up to her. I just can't imagine doing that, as stressful as it is. It's difficult for everybody but I just can't imagine doing that as much as the judges put me down on the runway. It's just part of the process, a part of the competition and you got to be able to take it. Q: Who are your favorite designers this competition? Buffi: Since day one, Chris - he's so talented and works so quickly like he has a sweat shop in both of his hands. [...] I was completely blown away on how talented he was - and all of the other designers. It was so cool being in that workspace because everyone is so different. Just seeing how different everyone works, it was just incredible. But yeah, Chris, since day one, I was like this guy is out of control. Q: Based on the bottom 3 and seeing that episode, do you think that you deserved to go home? Buffi: I do think it was a choice between me and Raul. I think I deserved at least another week. Q: Did you have a favorite challenge? Least? Buffi: I actually really liked the candy one - I had fun with it, even though the judges didn't really like it. There were a lot of things they put me down for, like the candy was melting. I think they were way too hard on me because Nate's was so heavy that the model had to hold her skirt up while she's walking, like I don't think that's very wearable. Elena's had fallen to pieces and they didn't seem to put her down for that. I feel like they were deliberately hard on me. Regardless, I had fun with it. Obviously, I felt the group one with Elena difficult. She turns into a psycho maniac. I did want to leave that day. I was like, I can't work like this, this is crazy. It wasn't fun anymore. She's way more stressed out than me and I did feel at that point I wanted to leave. 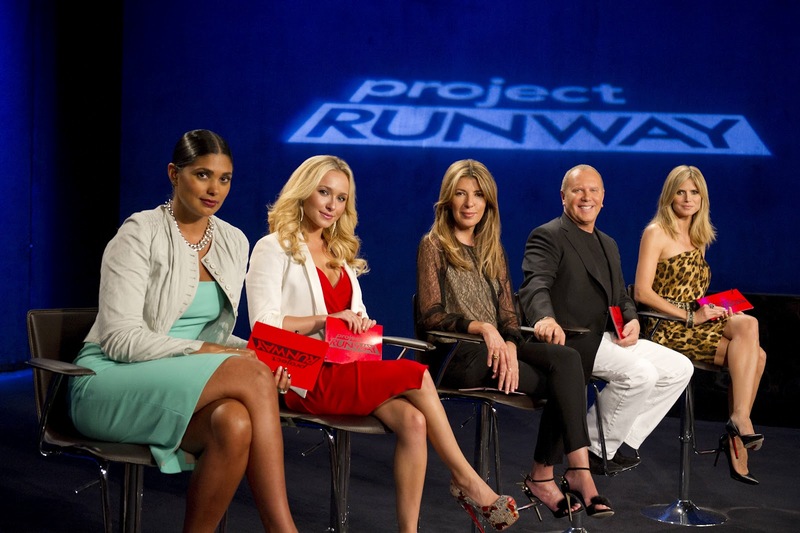 I am part of the Project Runway fashion network, so I am able to get access to interviews, images, and other media. I like the 2 looks you picked--they're both great! I love the dresses here! It's amazing! love the first look, so beautiful! kisses! Awesome guest judges and interview! I need to catch up on my PR! A book on dress making sounds like something I would read! Looove Project Runway! The second outfit is so cute :) I'm looking forward to your guest blog! i really liked buffi! although her design aesthetics arent what i go for, i admired her for staying true to her style. but i totally agree with her, i feel like the judges this season arent really giving constructive criticism, just criticism. i've never watched this show before. but it does look really interesting. The first two dresses are just my style! Poor Buffi! Even though I wouldn’t wear her outfit into my office at Dish, I still respect her for being true to herself. Now that she is gone, my new favorite is Chris. He has made stunning garments every time, and I can’t wait to see what style he cooks up this next episode. Luckily, I upgraded my DVR to the Hopper just in time, which lets me watch or record up to six things, or else I’d be stuck cooperating with my boyfriend’s obsession with Shark Week. Who do you guys vote will win? I really love the 1st two pieces! Love Rachel Roy!